a tumor consisting of displaced ectodermal structures along lines of embryonic fusion, the wall being formed of epithelium-lined connective tissue, including skin appendages and containing keratin, sebum, and hair. a tumor, derived from embryonal tissues, consisting of a fibrous wall lined with epithelium and a cavity containing fatty material, hair, teeth, bits of bone, and cartilage. Kinds of dermoid cysts are implantation dermoid cyst, inclusion dermoid cyst, thyroid dermoid cyst, and tubal dermoid cyst. Also called organoid tumor, teratoid tumor. 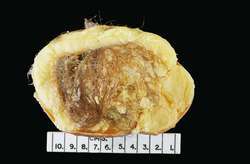 A benign teratoma, usually of the ovary, which is characterised by large amounts of sebaceous material mixed with mature tissue—including hair, teeth and skin adnexal structures, fat, bone, cartilage, thyroid and so on. Dermoid cysts may also appear periorbitally in children, as well as along the vertebral column, especially in the lumbosacral region, due to failure in the closure of the neural tube. Malignancies (e.g., squamous cell carcinoma, thyroid carcinoma) may arise in dermoid cysts. Pathology A benign teratoma of the ovary characterized by mature tissues, commonly sebaceous material mixed with hair, teeth and skin adnexal structures. See Teratoma. A benign growth caused by the abnormal infolding, during embryonic development, of a small quantity of surface tissue (ectoderm). Dermoid cysts occur mainly in the skin and ovary and often contain hair, bones or teeth. Dermoids of the ovary occasionally contain a cancer. A tumour containing keratin, sebum, fibrous tissue, hair or fat globules which may be found in the cornea, interior of the eye, or in the subcutaneous tissue of the superotemporal orbital rim. It presents as a round mass, about 1 to 2 cm in diameter, pink to yellow in colour. Limbal dermoids may be associated with Goldenhar's syndrome. There may be induced astigmatism. If vision is impaired or it is cosmetically disfiguring, treatment is by excision. A tumor consisting of displaced ectodermal structures along lines of embryonic fusion, the wall being formed of epithelium-lined connective tissue, including skin appendages and spaces containing keratin, sebum, and hair. Malignant changes have been recorded in dermoid cysts by New and Erich17 but not in the floor of the mouth, although a 5% rate of malignant transformation of oral dermoid cysts of the teratoid type has been reported by other authors. Ferrario E (1960) Association of ovarian endometriosiand dermoid cyst. 13 The causes of both epidermoid and dermoid cysts include failure of surface ectoderm to separate from underlying structures, sequestration and implantation of surface ectoderm. Dermoid cyst can be cured by surgical removal without recurrence. 6-8) Some reports describe a prior history of trauma followed by development of a dermoid cyst, as seen in this patient, who had a deep orbital dermoid. have reported a patient with neurological symptoms associated with acute onset of paranoid-psychotictype attacks in a series of seven cases of intracranial dermoid cyst (4). Dogs with Dermoid cysts are not likely to have any other set of health problems. Congenital inclusion dermoid cysts (CIDC) are rare and benign lesions originating from a failure during normal embryologic development of the neural tube (1,2,3,4). Fortunately, dermoid cysts in the most common location--the lateral third of an eyebrow have never been reported to contain intracranial connections, she added. Fortunately, dermoid cysts in the most common location--the lateral third of an eyebrow--have never been reported to contain intracranial connections. A dermoid cyst is a type of non-cancerous lump that forms from ovarian cells and may contain hair, bone, or teeth; they are typically removed in a minimally invasive procedure called a laparoscopy. Young women, stay informed and speak up! MY sister had a dermoid cyst removed a couple of weeks ago.